Machined T6 6061 aluminum seat rail kit for C5/C6/C7 Corvettes. Our C5/C6/C7 Corvette mounting bracket offers multiple installation options. The base can be purchased separately for use with sliders and side mounts you may already have. You can also purchase the base with dual locking sliders OR sliders and side mount brackets. We will be adding pictures of the sliders and side mounts with seat belt mounting points in the near future. Continental US shipping - $29. THIS BRACKET IS CURRENTLY ON BACK ORDER. EMAIL US IF YOU WOULD LIKE TO BE NOTIFIED WHEN STOCK IS AVAILABLE. 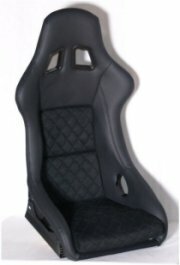 Seat mounting bracket for C5/C6/C7 Corvettes with ultra low seating position. Made from 3/16" steel and comes with a multi-position bolt in sub belt crossbar. The seating position in the rear is very low and may require the removal of padding or carpeting under the bracket for a few inches forward of the rear mounting studs on some vehicles. If you have any sensors under the passenger seat that are tall enough to reach the underside of the oem tracks this bracket will not clear them, as it sits lower than the stock rails. There are 8 different sets of holes for various slider width spacing and offsets pre-drilled. Additional holes can be drilled as needed. You will need to adjust the width of the slider release bar if the spacing between the sliders is changed. There are no provisions on the bracket itself for belt mounting but if sliders and side mounts are ordered we have seat belt adapters that will sandwich between the slider and the side mount and adjust with the seat, as pictured. C5 and C6 Corvette Rear Harness Mounting System. The floor studs in C5 Corvettes are generally too short to stack multiple brackets and still secure the oem nut in place. This part combines our Ultra Low Seat Mounting Bracket with a Rear Harness Mounting system, welded into one part, keeping the thickness around the rear stud to 3/16". C6's have longer floor studs and can have the two separate brackets overlapping each other. If you have any sensors under the passenger seat that are tall enough to reach the underside of the oem tracks this bracket will not clear them, as it sits lower than the stock rails. A multi-position bolt-in sub belt bar is also included. There are 8 different sets of holes for various slider width spacing and offsets pre-drilled. Additional holes can be drilled as needed. You will need to adjust the width of the slider release handle as the slider spacing is adjusted. There are no provisions on the bracket itself for belt mounting but if sliders and side mounts are ordered we have seat belt adapters that will sandwich between the slider and the side mount and adjust with the seat (see pictures in the Ultra Low Bracket product page). Stainless steel M18 adapters that thread over the existing M10 seat mounting studs in the floor and provide a raised mounting point above the carpet. Pricing is for 2 adapters with washer and nut. NOTE: These adapters do NOT fit through the holes in the oem seat track without modification. You will need to enlarge the hole for clearance of a M18 bolt. 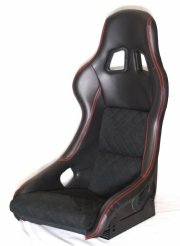 Our ST3 seat has been designed so it can sit very low while still using sliders in C5/C6/C7 Corvettes and other vehicles. The flared lap belt openings allow for easier use of oem seat belts inside the seat. We also can modify the lap belt openings so the C5 Corvette oem seat belt with retractor can fit through the opening. The ST3 is custom made to order in 4-6 weeks, allowing various upholstery options. If you would like something not listed in the drop down menus, please email us. Please see the product page for more details.